Christopher Bruce is licensed and bonded in Florida and has joined JMYS as yacht sales consultant. He left the Biotechnology and Life Science research industries after 30 years of Sales and Marketing, happy now to only need to put on a tie for formal events. Christopher purchased his Kadey-Krogen 44AE, Sweet Ride in June 2015 and has embraced the trawler lifestyle and loves talking about how to shift gears from life in the fast lane to life at sea. 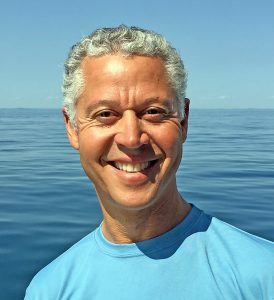 Being a full time live aboard and actively cruising (AKA Living the Dream) has allowed him to become part of the underway community and better understand the joys and expectations that you can only truly appreciate if you are doing it or have done it. This first hand, unique experience is often the same perspective that future owners hope to acquire and Christopher’s personality is very welcoming and he enjoys meeting fellow boaters and spending time visiting favorite ports of call from the Bahamas to Maine. Having logged over 12,000 miles in the last 2 years with his wife, Alexandra and cat, Mr. Anderson, he has become very familiar with life aboard, routine maintenance, long distance runs and the day to day aspects of owning and operating a trawler yacht. Since exiting corporate America and transitioning to full time cruising he has become passionate about helping future cruisers make their dream their reality and looks forward to working with friends and clients to help them learn the ropes and take off on their own adventures. Based on Sweet Ride, Christopher serves clients along the eastern seaboard.